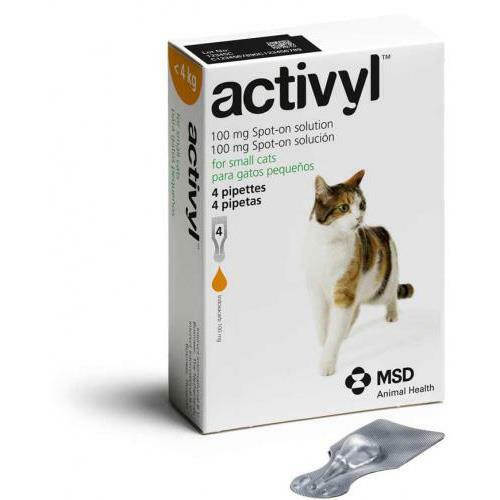 Activyl Spot-On for Cats And Kittens 2-9 lbs is a effective spot-on solution for the treatment of flea infestations in small cats. Each 0.51ml pipette contains 99.45mg Indoxacarb. Spot-on use. For application to the cat's skin only. The cat should be standing for easy application. Hold the pipette in an upright position away from your face. Snap the tip open by bending it and folding it back on itself. Part the hair until the skin is visible.Place the pipette tip against the skin at the base of the skull, where the cat cannot lick it off. Squeeze pipette firmly and apply the entire contents directly to the skin. Treatment schedule: Following a single administration, the veterinary medicinal product will prevent further flea infestation for 4 weeks.